The other Madrid club, not Galacticos but Colchoneros, the one minus all the big spending, has a new home jersey out, and we're glad to have it here. The new shirt looks very similar to the ones before it, as it shows the traditional ‘rojiblanco’ red and white stripes, yet there are some differences that true fans surely would've already noticed. 1. Crest: It has been modified in several ways: the number of stripes has been increased, and are therefore thinner, with the central part of the front of the jersey being red. 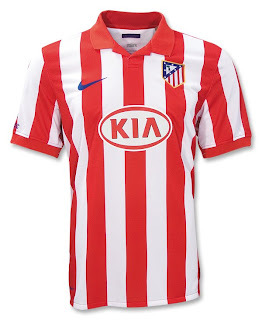 This change is to get closer to the beginnings of the Atleti vest. 2. Collar: After several years, the return of the red polo-style, fold-over collar. The Spanish flag will remain on the back of the collar. 3. Inscription: The inscription on the inside of the collar has changed from ‘Bendita afición’ (‘Blessed fans’) to ‘Espíritu de superación’ (‘Overcoming spirit’). 4. Label: Finally, a small label appears the side with ‘Atlético de Madrid’ on one side and ‘1903’, the year in which the Club was founded, on the other.